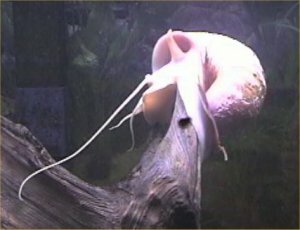 My albino mystery snail (apple snail), Snaily, on 6/19/05. Apple Snails or Mystery Snails? As I work on dividing up and updating my snail pages, my biggest dilemma is how to deal with apple snails. There are many species of apple snail. They are not all the same. Most mystery snails are apple snails but not all apple snails are mystery snails. Golden Inca snails, four-horned snails, and Columbian ramshorns are all species of apple snail. I will start with "mystery snails." This name is misleading. It was started back when someone bought new snails and did not know what species they were so they were named "mystery" snails but that is NOT a species name. All of those snails have actual species names. To this day though, many aquarium stores sell "mystery snails." Most of those are, in fact, species of apple snail. Mystery snails are medium-sized tropical snails. Some "mystery snails" are Ampullaria sp. such as the four horned and Golden Inca snails which are heavy algae and plant eaters. Another keeper of apple and mystery snails says that all mystery snails are the apple snail, Pomacea bridgesii (usually written incorrectly as Pomacea bridgesi ). Yet another source says they are all Pomacea cuprina ! The guy who runs applesnail.net says most mystery snails are Pomacea bridgesii or from the Viviparidae family. I have seen snails sold as mystery snails that are all different colors and obviously multiple species. There is no agreement between stores, keepers, and "experts" as to what is what. 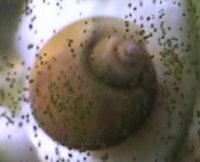 Some mystery snails eat algae and detritus and do not overly harm plants. Since they must be kept above 70 degrees F at all times (some can take as low as 50 degrees F short term), they cannot be kept in ponds except in tropical regions. They make a good heated-aquarium snail. Males may have a convex (sticks out) operculum or trap door, and females may have a concave (goes in) operculum. 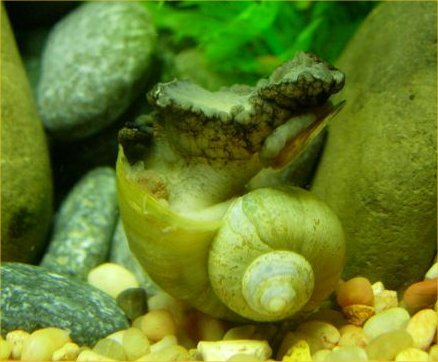 Mystery snails may "play dead" for days or even weeks by floating on the surface or laying still on the bottom (see here for more information). The reason for this dormancy is unknown. If anyone has a list of proper common and scientific names for any of the dozens of species of mystery snails, please e-mail me. The mystery snail truly is a mystery because it can refer to dozens of possible species with totally different attributes. No "experts" seem to agree on what is what! Apple snails are huge, tropical, debris and plant-eating machines. Apple snails belong to the family Ampullariidae and include the genera Pomacea (most common), Asolene , Marisa , Pomella , Afropomus , Lanistes , Pila , and Saulea . The first four are from the Americas and the other four are from Africa and Asia. 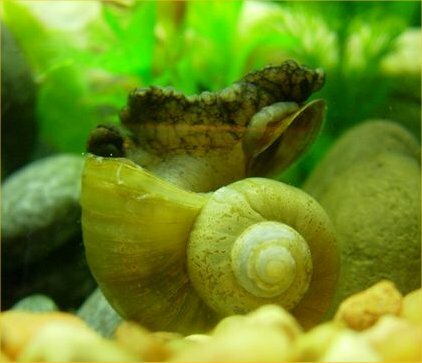 The apple snail most often sold in pet shops is Pomacea bridgesii also called the spiketopped apple snail or the black mystery snail. A keeper with P. bridgesii also had P. flagellata and P. glauca (may be four horned snails) which he said did eat and plants, salad greens, peppers, and herbs available but not algae. P. paludosa and P. canaliculata are also supposed to like vegetables. A few other species of apple snails are P. australis , P. haustrum , and P. caniculator . To figure out which species you have, visit applesnail.net's page on species. 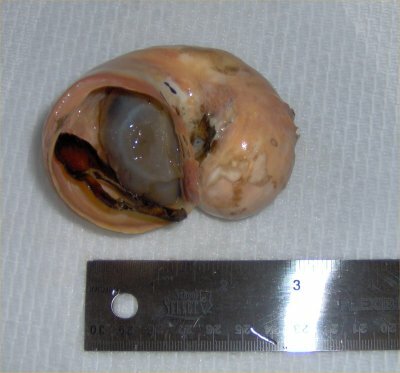 The species Pomacea maculata grows to six inches in diameter (like a tennis ball) so it is easy to believe that apple snails are the largest freshwater snails in the world. Due to their plant-eating and need to be above 60 degrees F, they are not suitable for ponds or planted tanks. They are fine for large, plant-free aquariums where they can be fed lettuce. A few sources say that apple snails do not eat live plants, preferring algae and dead plants and animals. But, if those foods are not available, the apple snails would have to eat the live plants. 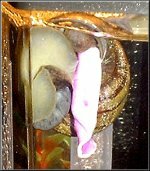 An apple snail may be placated by lettuce and spinach in a planted tank. Apple snails have both gills and lungs (with a breathing tube to stick out of the water to get air) and a hinge to close themselves completely into their shells. Despite their large size, large and even medium-sized fish may pick at the apple snails' exposed body parts and kill them. 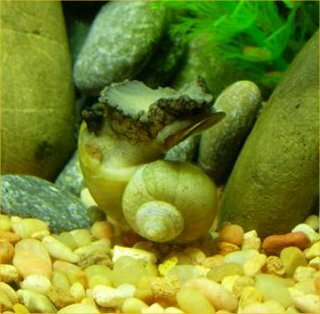 Some suggest that apple snails be kept in a species-only tank or with small fish. 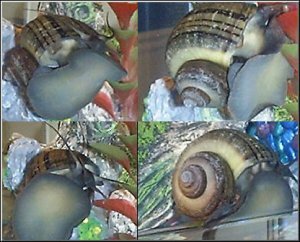 For anything you ever wanted to know about apple snails, visit this apple snail site. Another keeper of apple snails says they are most active from 72 to 78 degrees F but to reduce their consumption and waste, temperatures from 65 to 70 degrees F can be used. He fed his apple snails (baseball-sized species) canned spinach and crushed Hikari gold cichlid pellets. The four horned snail, or Pomacea cuprina (formally Ampullaris cuprina ), is a large, semi-tropical snail. 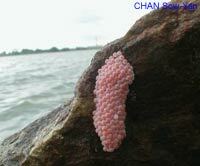 It is also a type of apple snail. It lays 200-300 hard yellow to orange eggs above water throughout summer and fall. They have a ravenous appetite and in my pond, they ate many of my water plants. However, their damage is minimal, and they seem to prefer eating detached pieces of vegetation. They can grow to a few inches in diameter. The ones that I had did not survive our mild winter in early 1998. An apple snail expert contacted me and said that the four horned snail is probably the apple snail Pomacea glauca or another apple snail. I got the above Latin name from Paradise Water Gardens so they may have been wrong or outdated. Golden Inca snails are very similar to the above four horned snails but have more gold. They are just a golden variety of the four horned snails. Since their Latin name is Pomacea cuprina aurea (formally Ampullaris cuprina aurea ), they may interbreed with four horned snails. They look like larger four horned snails. My Golden Inca snails did not survive the mild winter of 1998. I recovered one of their empty shells from the pond in March of 1999. It measured 2 5/8" long by 2" high. I took a photo but it was not good enough to scan in here. For more information, see apple snails above. A page on the black mystery snail (they say it is P. bridgesii ) can be found at this site (you have to search for it; the URL is too long!). The guy who runs applesnail.net says their albino snail is a P. bridgesiii and their " Ampullaria cuprina " is P. canaliculata . What a mess! "Did you know? The albino mystery snail was developed on a small betta farm in the SW Miami area by Carl A. Immeke, a fish breeder in the late 50s & early 60s. At first Carl thought that the snails were sick because of their pink color and sorted them in to a separate pond. Upon closer examination, he realized that the snail was actually an albino. The snails had been inbreeding for over 10 years, and that was the result. I am his son....Just thought you would like to know where they were developed and by whom. My father raised many beautiful bettas and had developed the lemon betta"
Apple snails lay eggs above the water line. They can leave the water for a few hours as long as they are kept moist. The eggs are usually pretty colors like yellow or pink. The color depends on the species. In aquariums, they are laid on the side or lid glass. 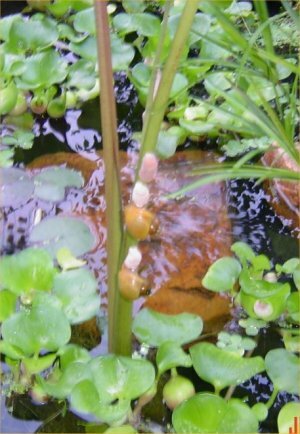 In ponds, they are laid on vertical plant stems. 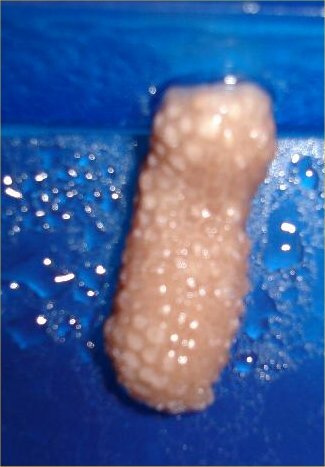 The following information is what one aquarist found but I cannot say how valid it may be. After about two to four weeks, they hatch. Eggs that do not hatch are usually not fertilized. Newborns may drown and need to stay out of the water (no mention of how long). 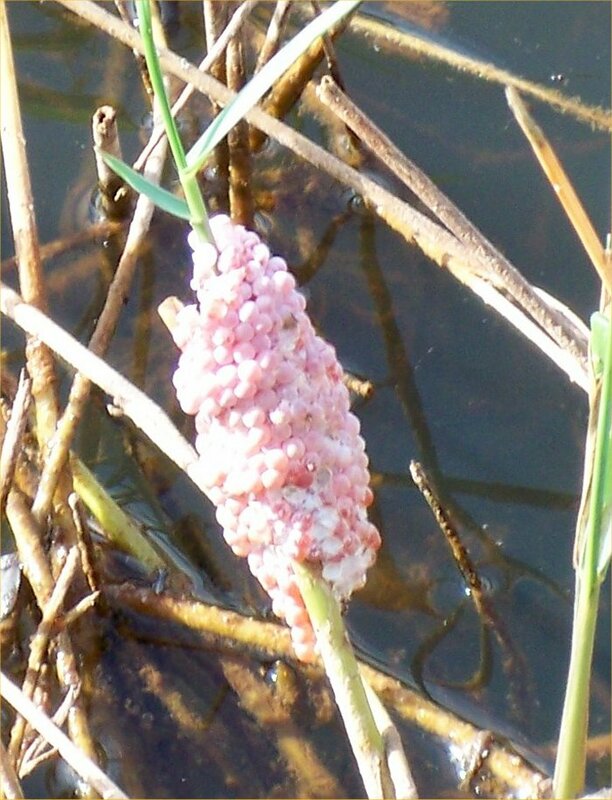 You can see photos of apple snail eggs below in the photo section. My snail on 2/7/03, wrapped around the thermometer. 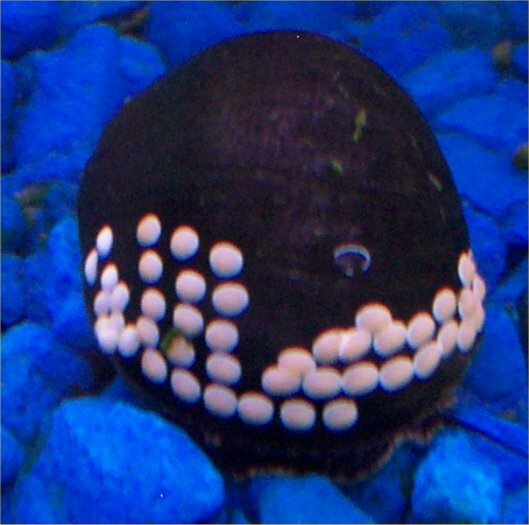 On 2/1/02, I bought my first "mystery snail" labeled as an albino mystery snail. His name was Snaily. Snaily went into my 20 gallon tank to eat algae off the glass. My pleco was too large to get much algae off the glass anymore. 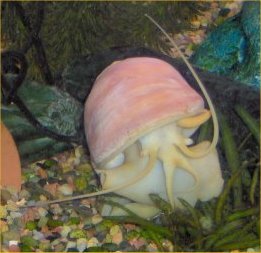 By checking out applesnail.net I thought I determined that my "albino mystery snail" was Pomacea bridgesii or the spike-topped apple snail. You can see their page on this species here including lots of photos and info! My new snail decided to eat all the plants in my tank. Later, the webmaster of applesnail.net informed me that my snail is not P. bridgesii but in fact P. canaliculata which explains why he did not behave like P. bridgesii is reported to behave. Pomacea canaliculata grows as large as a soft ball. Mine ate mostly plants, algae tablets, and cucumbers. Yes, my innocent little snail that the store said only ate algae ate almost all the vegetation from the tank within a month including java moss, valisneria, brush algae (which I wanted him to eat), anubias, and crypts. There was not much left (3/6/02) so then he lived off the pleco's cucumber and algae wafers. Did I regret getting him? Not really. He sure took care of the algae on the plants since he ate it and the plants! The plants were in bad shape anyway. I then brought in some nice plastic plants he could not eat! 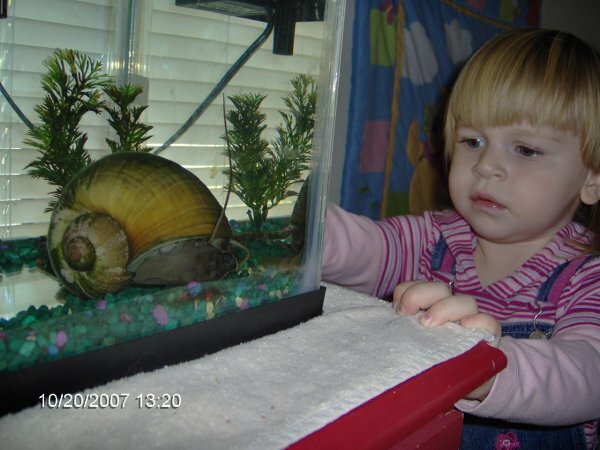 On 10/27/05, my Snaily died. I had him for 3 years and almost 9 months. The month before his death, he stopped moving and stayed in one place, sometimes sticking his feelers out. I picked him up daily to either see him moving or his trapdoor firmly shut. As the days past, his trapdoor receded further and further back into the shell when, at first, he could not even shut himself in at all for all his flesh. He lost weight and died. Why he starved himself I do not know. His shell incurred some degradation from the softer water but no actual holes ever resulted. I buried Snaily. Before doing so, I took the photos below for informational purposes. If you are squeamish, do not view them. Apple snail shell uploaded 3/9/02. I think this was an empty shell from my 1800 gallon pond. For some reason, I never linked it in (linked in 4/20/12, wow 10 years later!). Snaily on 2/7/03, wrapped around the thermometer. Here is a photo on 7/12/03 when he had his feelers out. 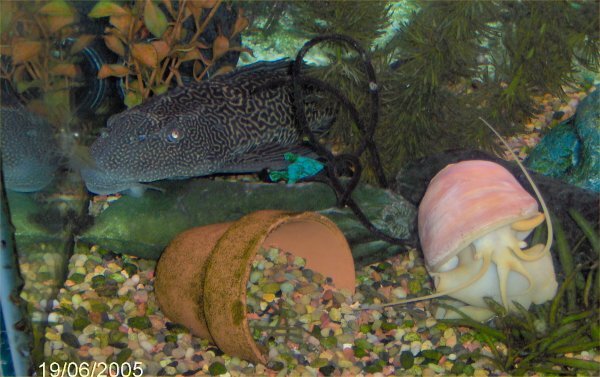 Here is my apple snail and plecostomus on 6/19/05. Dead apple snail - view down into the dead flesh, 10/27/05. Dead apple snail - top view, I am afraid when I turned him over, his guts fell out (do not view if this grosses you out please), 10/27/05. 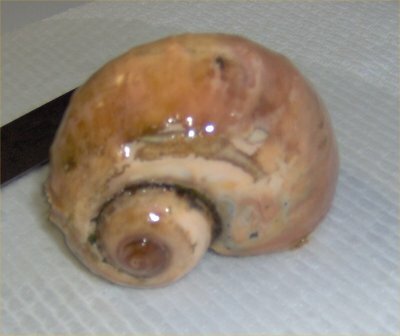 Dead apple snail - side view, you can see the curl in the shell (no guts in this one), 10/27/05. 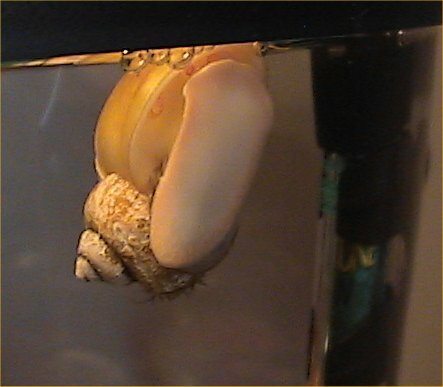 Photo of an apple snail, Pomacea bridgesii , provided by a visitor to this site. Another photo of the same apple snail. Four photos of an apple snail. P. bridgesii next to her eggs. 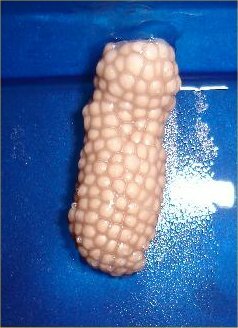 Apple snail eggs - uploaded 3/9/02. 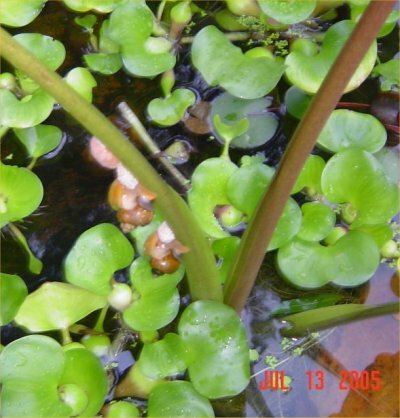 Sharon sent photos of apple snail eggs in her pond on 7/7/05: snail eggs and close-up of snail eggs. She then sent a few photos of the yellow apple snails actually laying the eggs on 7/13/05: two apple snails and three egg cases and two apple snails and three egg cases again from another angle. Water hyacinth is on the pond's surface. 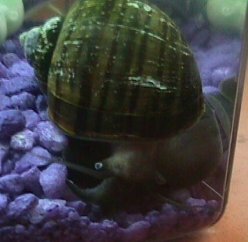 Elizabeth had a blue mystery snail (it is an apple snail) that was acting unusually. She sent photos on 4/29/07. I was not sure what was happening but felt the snail was dying. She said the tank had high nitrites. 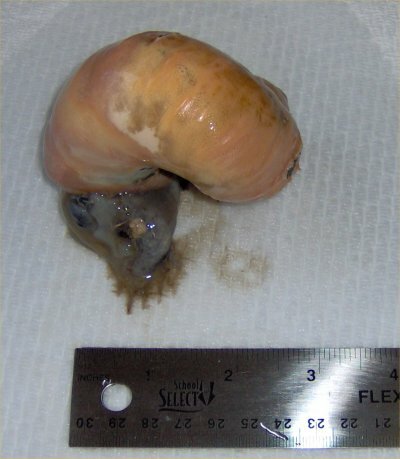 Here are some photos of the sick apple snail. Sarah sent this photo of her snail on 2/25/07. On 10/21/07, Birgitte sent this photo of one of the biggest snails I have ever seen! She got the snail because it was eating someone else's goldfish! 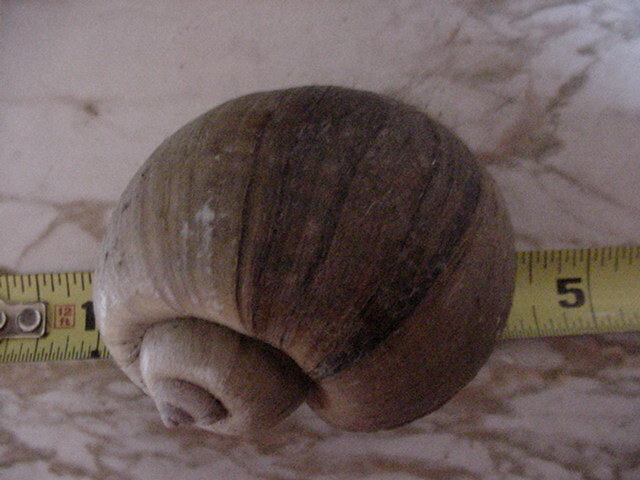 In the photo, the snail was about 4 years old and 5 inches in diameter. Rosie sent these three photos of golden "mystery" snail eggs on 1/14/08. 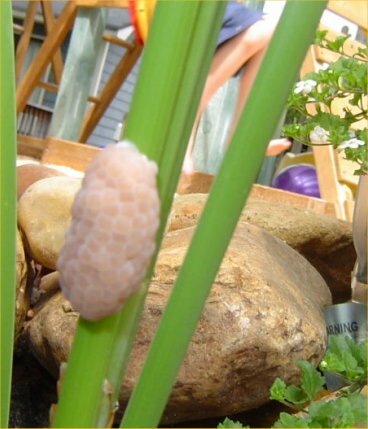 Vanessa sent this photo of her apple snail covered in pink dots on 7/30/08. My response was "That is really strange! I've not seen anything like that before! They look like pink candy dots. My best guess is that the pink things might be apple snail eggs. 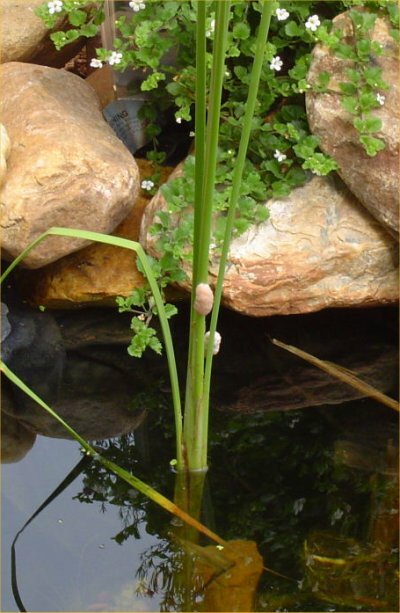 Apple snails normally lay pink or yellow eggs in clusters above the water line. If, for some reason, they cannot get up there, something goes wrong, or another snail is up there with them, a female might lay eggs on another snail. The things on the snail are not laid as I normally see apple snail eggs though in large bunches. They seem to be very small bunches or even singly. If that is not what they are, I do not have a clue! As for what species of snail that it is, I cannot see much of the snail but based on its size and the possibility of those being apple snail eggs, it may be some sort of apple snail." Applesnail.net - THE web site for all things apple snail. That site tells you how to tell if you have an apple snail, how to tell which one you have, how to feed, how they function and breed, and tons more! A site with some apple snail questions and answers can be found at this site. Here is a page about Columbian ramshorn snails.